Meet at the Visitors Center Parking Lot for this joint trip with the Perkiomen Watershed Conservancy. We will bird the refuge for waterfowl, raptors and other fall migrants. Bring your lunch and a scope if you have one. Leader: Leigh Altadonna. 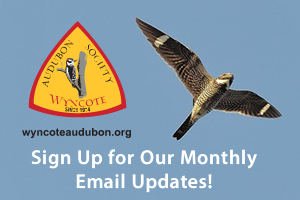 We encourage participants to regularly check both the Wyncote Audubon Society website and Wyncote Facebook Page in advance of a field trip as the meeting location can change due to road construction, a park closure, weather conditions, or other last-minute circumstances. If you have any questions about a field trip, please use the contact form below. Plan on arriving a few minutes before the scheduled time of the field trip. The time stated is the STARTING time, not the arrival time. This will give you time to get yourself ready, say hello, visit a restroom and be ready to go. For all day trips, please come prepared with lunch and have a full tank of gas. PARTICIPANT RELEASE: My participation in a Wyncote Audubon field trip or event signifies that I agree not hold the Wyncote Audubon Society or any of its agents responsible for any accidents, losses, damages or injuries resulting from my participation in the field trip or event.